Welcome to A10 Talk’s Top 25 Player Countdown. Each day, we publish a new article counting down the 25 best players in the Atlantic 10 this past season, as voted by our staff. Today, we feature #17 Yuta Watanabe of George Washington. Yuta Watnabe was a staple to the George Washington program throughout his 4-year tenure. Without Tyler Cavanaugh in the mix in 2017-18, the senior had to step up. The Colonials certainly didn’t have the kind of season they wanted to, but Yuta Watanabe left it all on the floor, especially on the defensive end where he won Defensive Player of the Year honors. Yuta had some big moments throughout his career, and a strong senior season brings him in at #17 on our Top 25 Player Countdown. It’s difficult to single out individual performances when Yuta Watanabe only failed to reach double scoring digits three times in his final year. Watanabe had a career-high 31 points in his 4th to last game of the year, taking down Fordham at home, marking the first 30+ point game of his career. 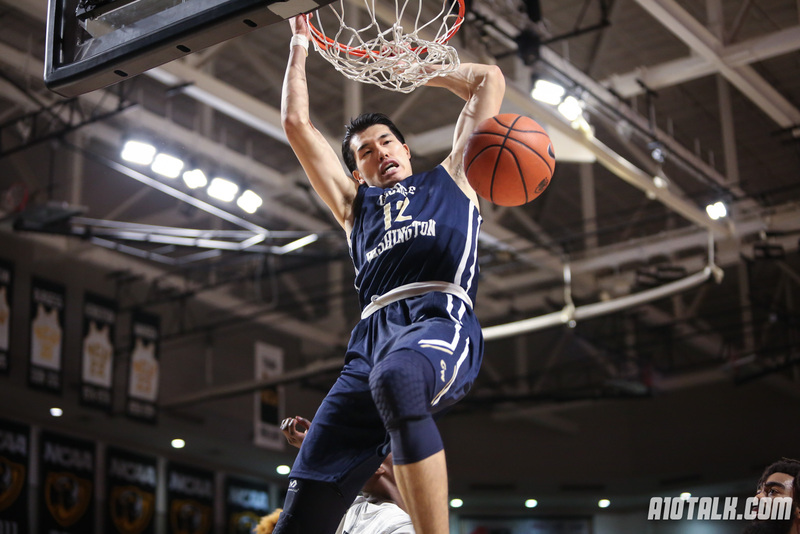 Watanabe had 17 points, 6 boards, and 3 assists against Temple, arguably George Washington’s best win of the 2017-18 season. He also went off against La Salle late in the year, dropping 29 points. Again, Watanabe’s contributions can’t be narrowed down to individual performances because his offense and defense were stellar from November to March. 91.4%. Watanabe played 91.4% of available minutes his senior season, ranking 23rd in the nation. He was an absolute workhorse in his last season, and MOJO got the most out of his senior. 41.9%. Yuta Watanabe stepped it up big time during conference play, firing at a 41.9% clip from deep. This was in comparison to just 31.4% his junior season. Yuta Watanabe was a staple to this program and certainly a crowd favorite. He plays with heart and passion every time he steps on the court, and I’m sure the Colonials wish they could get a couple more seasons out of him. Unfortunately, the Colonials couldn’t put the pieces together in 2017-18, but Watanabe was the reason they stayed competitive in some games, especially towards the end of the regular season.